I know that its Breast cancer awareness month, but this month has an emotional meaning to me. 12 years ago on Oct. 13th my grandfather died of Lung cancer. He was a brave and strong man. I then years later lost my only uncle to Colon cancer. Cancer plays a part in my life that I wished that it wouldn't of. I miss my grandfather and my uncle every day. I was close to them. I was my grandfather's first and only granddaughter for 5 years before my other only female cousin came along. So me and my grandfather were very close and me and my uncle too as I was the only kid around for them to spoil. Tons of great memories with each of them. 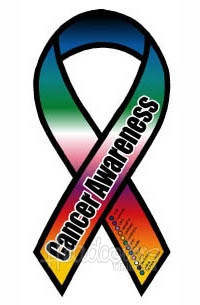 Thoughts and prayers go out to all of those that are dealing with family and or friends that are dealing with any kind of cancer. Thank you :) And yes I sure will follow you, have a great evening/week.